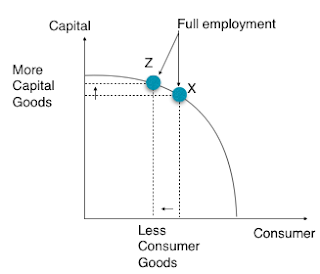 (A) Draw a CLG of the PPC, with consumer goods on the horizontal axis and capital goods on the vertical axis. 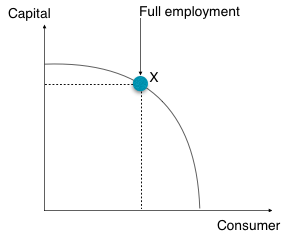 Indicate a point on your graph, labeled X, that represents full employment and a possible combination of goods produced. (B) Assume that there is an increase in the country's national savings. 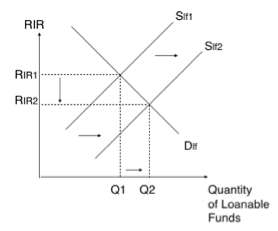 Draw a CLG of the loanable funds market, showing the change in the real interest rate from the increase in savings. Understand that if savings is increasing then the supply of loanable funds is increasing. If the supply of loanable funds is increasing then the RIR, real interest rate is falling. (C) On the same graph in part (A), show another point, labeled Z, that represents full employed and a new combination of consumer goods and capital goods consistent with the increase in the nations increased savings. Higher rate of savings implies a higher rate of capital investment which will lead to more future growth. (D)Referring to your answer in part (C), will the long run aggregate supply curve shift right, left or remain the same. The LRAS will increase in the long-run as savings increase, consumption and investment will increase. Investment will increase in capital goods and therefore future growth can be expected with a shifting rightward of the LRAS curve.